“On August 3, 2011, HHS issued an interim final rule mandating coverage of all FDA-approved contraceptive drugs (including a drug that can cause an abortion in the first weeks of pregnancy), female sterilization methods, and related education and counseling as ‘preventive services for women.’ The rule included an incredibly narrow four-pronged ‘religious employer’ exemption . . . . It has been said that Jesus and his apostles would not be ‘religious enough’ to qualify for the exemption, as they healed people of other faiths. . . .
Days ago, on February 10 – despite many thousands of comments urging it to change course – the Administration issued a regulation in which the rule of last August is ‘adopted as a final rule without change.’ . . . In short, we are back to square one -- except that the rule so many hoped would change to accommodate Americans’ right of conscience is no longer subject to change, except by legislation. This brings me to the Respect for Rights of Conscience Act.” Continue reading. Action Alert: Have you contacted your representatives about supporting the Respect for Rights of Conscience Act? If not, please click here. We must make our voices heard! Visit prolifedallas.org/conscience for more info. Join us for the final presentation in the pre-TX primary Faithful Citizenship series: "Goals for Political Life: Challenges for Citizens, Candidates, and Public Officials," featuring Jennifer Carr Allmon of the Texas Catholic Conference, the Public Policy Voice of the Catholic Bishops of Texas. with any questions. Sponsored by Catholic Charities of Dallas, the Catholic Pro-Life Committee, and the St. Elizabeth Ann Seton Justice Ministry. Kickoff Rally this Sunday, Feb. 19! The largest-ever Spring 40 Days for Life campaign begins on Feb. 22. McKinney is hosting the only spring campaign in the Diocese of Dallas. 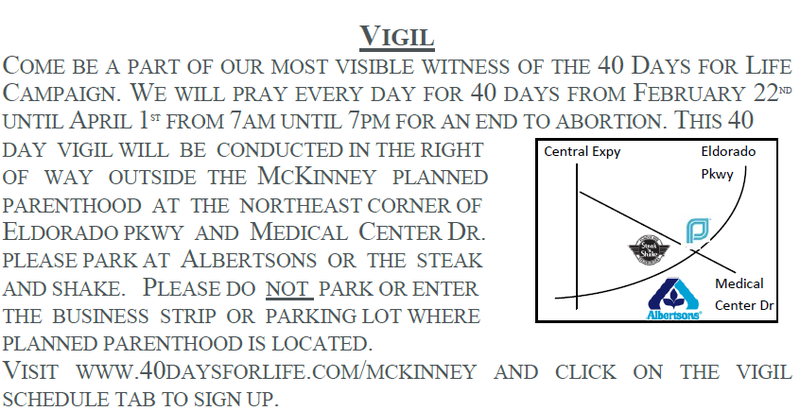 The McKinney Prayer Vigil will take place from 7 a.m. – 7 p.m. in the right of way outside the Planned Parenthood at the northeast corner of Medical Center Dr. and Eldorado Pkwy (map). 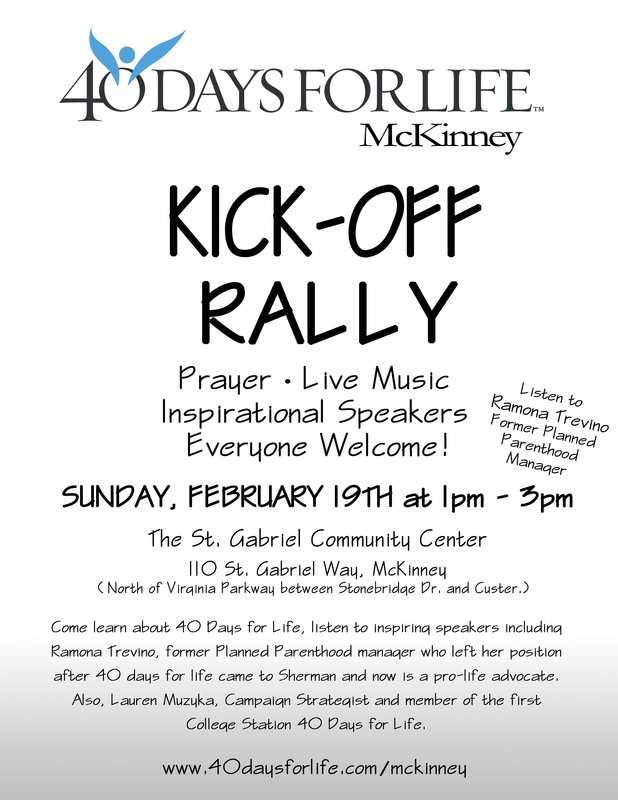 For more info and to sign up for the prayer vigil, visit 40daysforlife.com/mckinney. Sponsored by 40 Days for Life-McKinney. Time: 7:00 a.m. - 7:00 p.m. The Most Reverend Kevin J. Farrell invites you to attend The Bishop’s 19th Annual Catholic Pro-Life Dinner: “That They Might Have Life” on Saturday, April 14, 2012 at the Irving Convention Center at Las Colinas, featuring actor and singer John Schneider, the star of two new pro-life movies! This event benefits the nine-life saving ministries of the Catholic Pro-Life Committee. 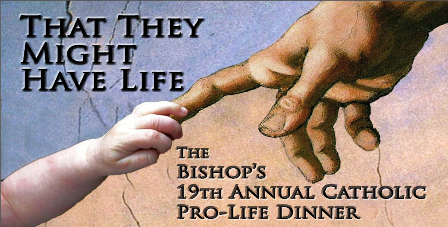 The evening will include a private reception with Bishop Farrell and John Schneider, a $15,000 Gift Card Raffle, Wine Pull, Big Board Auction, Pro-Life Exhibits, and more! Don't miss this spectacular evening – seating is limited. Make your reservation and buy raffle tickets today at prolifedallas.org/dinner or call 972-267-LIFE (5433). 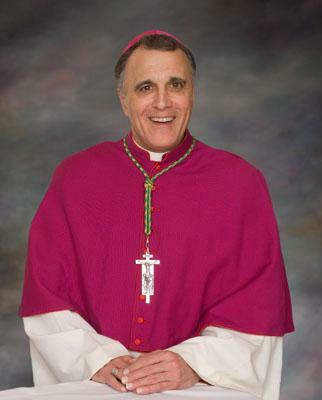 This year at the dinner, the CPLC will recognize one special hero of the movement, who will receive The Father Edward Robinson, O.P., Pro-Life Person of the Year Award. Click here to submit your nomination today (open until Mar. 1). 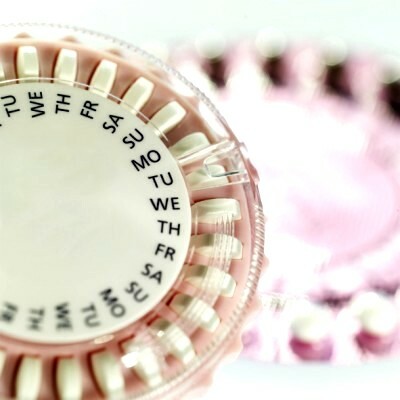 Business Insider: "Time To Admit It: The Church Has Always Been Right On Birth Control"
Painting the Catholic Church as "out of touch" is like shooting fish in a barrel, what with the funny hats and gilded churches. And nothing makes it easier than the Church's stance against contraception. . . . Here's the thing, though: the Catholic Church is the world's biggest and oldest organization. It has buried all of the greatest empires known to man, from the Romans to the Soviets. It has establishments literally all over the world, touching every area of human endeavor. It's given us some of the world's greatest thinkers, from Saint Augustine on down to René Girard. When it does things, it usually has a good reason. . . .
A former Planned Parenthood employee continues to make the case publicly that the abortion business had a routine policy defrauding government and is pressing a lawsuit against her former employer. . . . Planned Parenthood has been found to have engaged in fraudulent billing or faces accusations of such improper billing in multiple states (read more here). 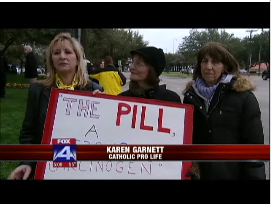 to thank her for showing the sign "The Pill, a Group 1 Carcinogen" [World Health Organization] in this story to help get the truth out. For more information about the truth about Planned Parenthood, see prolifedallas.org/plannedparenthood. A mysterious drifter, a town with troubles, secrets will be revealed and the question on everyone’s lips will be answered: Who is Sam Doonby?